The director of the Museum of Australian Democracy, Daryl Karp, in the House of Representatives at Old Parliament House. Photo: Jamila Toderas. 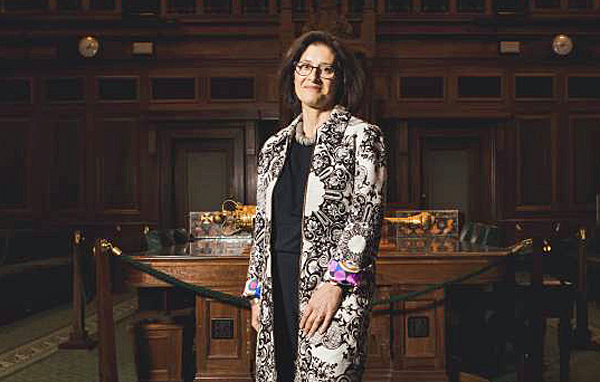 The director of the Museum of Australian Democracy in Old Parliament House is baffled by the contents of a new report into her institution. She called it “curious” and “strange”, and said that much of what the MPs involved were recommending was already being done. The report, titled Telling Australia’s story – and why it’s important, says that the museum in the grand former seat of parliament should “focus on developing visitors’ understanding of the nation’s democratic history, and inspiring their faith in our democracy”. But Ms Karp said that’s exactly what they do at the museum – and in an imaginative way that engages ordinary people. “The stories we tell are about the way people live,” she said. “That’s the way to get them in. The people who run the museum feel that they do the job imaginatively, so that instead of dry and dreary exhibits about, say, parliamentary procedures or written records of speeches, they offer exhibitions about democracy which ordinary people – voters and taxpayers – can relate to. The director cited the exhibition titled The Gift, which was about a toy koala given to the 100,000th post-war British migrant to Australia. The 50,000th migrant had been given a similar gift, and the museum contrasted attitudes to migration and how they had changed between the two dates. People were asked to write imaginary letters to a migrant. There were artworks and films. The message of the exhibition was positive about immigration: “The gifts of immigration are tangible; Australians give freedom, prosperity, safety, while immigrants give us expertise, prosperity and diversity,” the promo material said. It was a broad view of democracy and citizenship – of the rights and obligations of ordinary people – which was wider than parliamentary procedure and the activities of politicians and their parties. Ms Karp said that the museum needed more money. “If I can get one message out there, it would be that the cultural institutions are poorly funded,” she said. She cited the exhibition about prime ministers of Australia. “One more prime minister and we’ve run out of space,” she said. She also took a swipe at the report’s suggestion that the public cultural institutions in Canberra should co-operate and talk to each other more. She said that they already did, with the heads meeting informally once a month. The museum gets 350,000 visitors a year, according to the director’s staff, adding up to a million including online people in contact. There were 85,000 students who visited, with 5000 teachers. “A lot of the work we do is with teacher professional development,” Ms Karp said. She said she would study the MPs’ conclusions and decide what action to take. At the museum on Thursday, there was some support for her positive view of its achievements. Graham Harsant, visiting from Mooroopra in Victoria, said what he saw was “excellent”. “I thought there was a fair bit of information and that it’s done a good job of being from across the political spectrum,” he said. Did he agree with the report when it said the museum “should improve its focus on developing visitors’ understanding of our nation’s democratic history, inspiring faith in our democracy, and leaving visitors educated and excited about their agency in Australia’s political system and how they can play a more active part in it”? He did not. “I disagree with that statement. It does a wonderful job,” he said. His only complaint was that he didn’t understand the map at the entrance.